Fur and Hair are the Same Thing. There are many different types of hair, in respect to hairs that all mammals may possess (and many species have many different varieties of hair on their body, to include humans). But all hairs are essentially made of similar material, though they vary in function and growth pattern/rates. You’ll often hear “the cockapoo has hair, not fur” as if that explains it. But it doesn’t since fur is hair. For this reason a dog with a minimal “under coat” and who does not shed seasonally (such as a Cockapoo) is preferable for those with pet allergies or for those that simply abhor their clothes and furniture covered in dog hair all the time. The term “non-shedding” is true for most Cockapoos, but it is very often used to mislead people because the hair of all mammals fall out at some point… and the use of the word “hypoallergenic” for dogs is really misleading. This term is accepted by the community, however I really object to the use of this term. The definition of hypoallergenic is “non-allergy producing”. This is such an important topic, as it is related to the health and well-being of the dog owner (and therefore the health and well being of their dog) that it deserves proper attention. With the purpose in mind to keep this post from being ridiculously long and arduous, I have written a separate post about “hypoallergenic dogs”. You can read that post here. A non-seasonally shedding coat makes for thinner, less flaky skin. This results in a lot less dander and therefore a lot less allergies. Single-layer “hair” coated dogs are significantly better for allergy sufferers. Some of us with allergies (my seasonal and pet allergies can be downright miserable) love these crosses because of the lower level of airborne dander. As a mom, I also like that I do not have to constantly vacuum up dog-hair tumbleweeds bouncing across my living room floor (especially when I have a baby crawling around, attempting to eat everything in his path of hunger and destruction)! Actually, I can’t find many. Post some in the comment section if you can think of a few. Most non-shedding coats grow long. And in general the longer the better for the allergy sufferer. These coats always require more maintenance than the short-haired counterparts. On top of regular grooming these coats require regular haircuts. So you’ll either need to learn dog beauty school tips and tricks and shell out cash for good equipment or you’ll be paying a pretty penny to a groomer every 6 weeks. The dogs with open (non-bearded) faces in the cockapoo crew don’t require clipping but still need regular brushing. They do not seasonally shed but they lose hair more often than their ever-growing bearded buddies. Does the Cockapoo Lose Hair At All? Yes. Despite not shedding seasonally the Cockapoo will still lose hairs. How often the Cockapoo loses hair will depend on how long the individual dog’s coat is. A smooth-coated (or non-bearded) Cockapoo has a shorter coat and so each hair reaches the end of its life-cycle more quickly than the hairs on a long-haired bearded Cockapoo. So you’ll see more hair. But the smooth coated Cockapoo still does not shed seasonal fur (when bred properly and beyond the first generation cross, that is). All mammals lose hair… You and I lose hair naturally and normally! If you (or your spouse) have ever had long hair, you know what I’m talking about. Ever see the bathroom floor after a woman with long hair brushes it out? The Cockapoo’s coat doesn’t fall out all at once or constantly, like seasonal-shedders, but random hairs fall out when they reach the end of their natural growth cycle. (Usually several years for each hair if it isn’t pulled out. Again, very similar to people-hair). The coat on a Cockapoo is much thinner than a seasonally-shedding coat, which also lends to less hair-losing, as there is less hair to lose. This also makes the Cockapoo less weather-hardy. Cockapoos often have a nice curl to their coat. This is also a big plus for allergy sufferers. The curl in the coat tends to keep the hairs that fall out (naturally at the end of their growth cycle) wrapped up in the rest of the coat instead of falling out on the floor or becoming airborne. Those then get taken out when the dog is groomed. 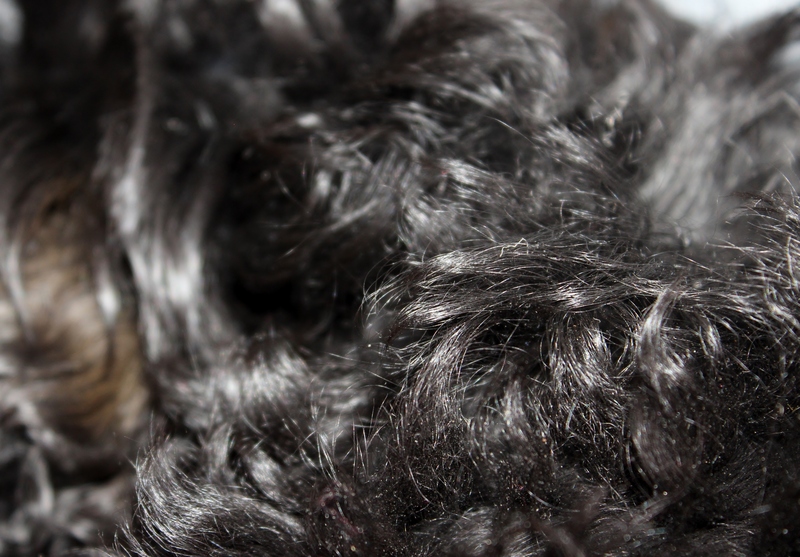 The curl also helps to prevent airborne dander when the dog scratches himself, gets pets/affection, or rolls around on the carpet giving himself a back-rub (which they love to do). The dander can then be bathed off. When wet, the dogs don’t bother my allergies, as the dander cannot get airborne. So the curlier the dog’s coat-the better for those that suffer from pet-dander allergies. Some Cockapoos have smoother, less curly coats. These dogs can appear to “shed” more than their curly counterparts. Except for the minor differences between dogs with different hair lengths (and hair life-cycles) this is all based on the illusion brought about by the curly coat trapping lost hairs. Of course curly coats also trap lots of outside pollen and dust and if you’re allergic to that then giving your cockapoo a hug can bring tears to your eyes (and sneezes to your nose) in a less than pleasant way. So there is always a trade-off, isn’t there? Having raised all kinds of dogs I can tell you that I appreciate the low-shedding qualities of both the smooth and bearded variety of Cockapoo. I have not had one “hair tumbleweed” in my house since owning only Cockapoos. And that is no joke! The “dog hair tumbleweed” or the dog hair wad/ball/mass the size of a dust bunny big enough to scare your guinea pig…. is a very real annoyance. Yes, Cockapoos do not shed a seasonal coat. But they still do have hair (fur, or whatever you want to call it). Cockapoos still lose hair, though. This entry was posted in All about Cockapoos, Human Health when Living with Dogs and tagged allergies, cockapoo, hypoallergenic dog, low shedding dog, non shedding dogs, non-shedding. Bookmark the permalink. Nice article on “non shedding” Cockapoos and good job on keeping it real 🙂 So many people are mislead when it comes to finding “dogs that don’t shed”. I recently wrote an article answering a similar question, “Do Non Shedding Dogs Exist?” for anyone interested in learning more.